Every day is full of bliss, joy and merrymaking in Merrymaker Land. Yes, that’s a place! And you get to experience it too when you tune in to this week’s episode. The Merrymaker Sisters Emma and Carla Papas have hit the ground running on Your Brilliant Un-Career to blow your mind with their “making the leap” story. In this episode, Emma, Carla and I talk about everything, and I mean EVERYTHING … leaving a job you hate, weight, health, Paleo food, bodily functions, secret women’s business (you have been warned), working with family, how Merrymaker Land is going to rival Disneyland and more. This is a very candid discussion with lots of laughter and fun but some important life and business lessons. To add some sunshine and unicorns to your day, listen in. If you’ve thought about or recently made the leap into entrepreneurship, but you’re finding the journey overwhelming, I want to help you land on two feet and gracefully overcome the challenges that stand in your way. You can do it. You are doing it… as am I. We are in this together! Through the stories my guests and I share on Your Brilliant Un-Career, the Podcast, I aim to help you shift from stuck to inspired, from dreamer to doer. This podcast is proudly brought to you by my bestselling book: Your Brilliant Un-Career: Women, Entrepreneurship, and Making the Leap, out now on Amazon. 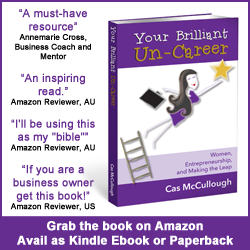 http://bit.ly/uncareerp (Paperback version) http://bit.ly/uncareer (Kindle version), and Shift Club, creating marketing that moves… your business, your community and the world! Emma and Carla Papas, ‘The Merrymaker Sisters’ are communication professionals turned health and happiness advocates and passionate health coaches. Their website and social media channels reach over 150 000 people every month. They will inspire you with real, paleo food recipes and help you find and follow your bliss. Throughout their merrymaking journey they’ve published the healthy cookbook Make It Merry, partnered with international brands like Reebok, Microsoft and Fitness First to inspire and connect like minded people together and have been featured across international and national media channels such as Mashable, MindBodyGreen, The Age, GoodFood and Channel 10. It doesn’t work if you don’t believe in it. We all just need to learn to accept how we are this moment and take a positive step towards change. We grow up thinking that we’re just mean’t to be tough and thick skinned. We’re told not to cry, not to feel and that just makes us sick. Mentions: Thermomix and The Four Blades Podcast. We were in stable jobs and it was really risky to quit those jobs. However, we turned that risk on it’s head. To us, the biggest risk is to get to our fifties and realise we just wasted our lives. What you focus on grows. quote from random Spiritual Youtuber mentioned by Carla. What if we had 24 hours, seven days a week where we focused on loving what we do. Chapter 3 of Your Brilliant Un-Career talks about planning for your awesome business success. I have done a terrific interview with author and leadership expert Alison Vidotto on this topic that I want you to have. Access this interview for free here, along with 32 other business building podcast interviews, templates, worksheets and motivational affirmations.